When it comes to nutrition, we have a lot in common with our pets: We both love to eat, treats are often our downfall, and our obesity epidemics are sadly in sync. Diet also plays a role in our shared ailments, such as heart disease. So close are we, in fact, that some veterinarians think dogs and cats could help us solve the problems of human nutrition. Simin Nikbin Meydani, director of the Jean Mayer USDA Human Nutrition Research Center on Aging at Tufts and president of the American Society for Nutrition, invited some of them to speak about “one nutrition” at the Experimental Biology conference in April. Studying nutrition in companion animals has advantages over using the typical lab rats and mice, says Lisa Freeman, J86, V91, N96, who earned her doctorate at the Friedman School and is a veterinary nutritionist at Cummings School of Veterinary Medicine. Rodents can be bred to develop certain diseases, but it doesn’t really reflect what you would see in a person, Freeman says. Our pets, on the other hand, naturally develop many of the same health problems that we do. “These dogs have been bred for certain characteristics—how they look and how they act. We unfortunately then have bred in certain diseases,” Freeman says. Take heart disease. 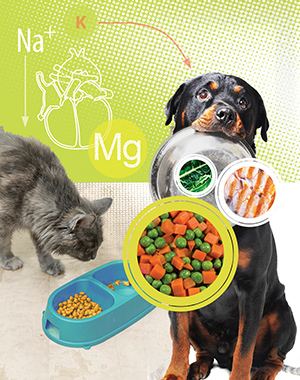 About half of Doberman pinschers develop a heart condition called dilated cardiomyopathy, and 80 to 90 percent of King Charles springer spaniels develop mitral valve prolapse. “We have those specific breeds that develop a disease at higher rates than you would see in the general human population,” she says. Freeman is researching how nutrition can slow the progress of these diseases. Sodium restriction can be very important, as well as proper levels of B vitamins, potassium and magnesium. In one study, boxers with dilated cardiomyopathy that were given omega-3 fatty acids had fewer heart arrhythmias. Deborah Linder, V09, who counsels pet owners at the Tufts Obesity Clinic for Animals, sees potential for programs that help pets and owners lose weight together. She points to one study that showed that while people who exercised with their pets did not lose more weight, they did enjoy exercising more and were more likely to stick with it. About 54 percent of cats and 56 percent of dogs are overweight. Unlike humans, however, they don’t care if they are fat. “On the playground, the overweight dog isn’t shunned in the corner,” Linder says. “Dogs have no self-body perception and don’t perceive it in others.” She can envision nutrition studies where it would be useful to have such stigma-free subjects. Cats and dogs are not immune to fad diets. Just about every human diet trend—gluten-free, raw foods, antioxidant “superfoods”—eventually makes its way to the pet food industry, and the lag time has all but disappeared, says Kathryn Michel, V83, a professor of nutrition at the University of Pennsylvania School of Veterinary Medicine. Some of these diets are not benign, such as the raw pet foods that were found to carry salmonella and listeria, dangerous pathogens that can be passed to humans. Some grain-free pet foods, designed to appeal to the notion that dogs’ wild ancestors didn’t eat grains, contain potato starch and tapioca, “which I also don’t think wolves are eating in the wild,” Michel says. Perhaps the biggest translational value of that knowledge is the mirror it holds up to human nutrition: When you find yourself buying dog treats because they are enriched with kale and pomegranate, it should make you wonder if a food fad has gotten out of hand. Julie Flaherty, the editor of Tufts Nutrition magazine, can be reached at julie.flaherty@tufts.edu.